Target Designator, Perhaps Other Uses, Time for a New Alidade? Looking at a new device caused me to consider how we might improve an old one, the Alidade. 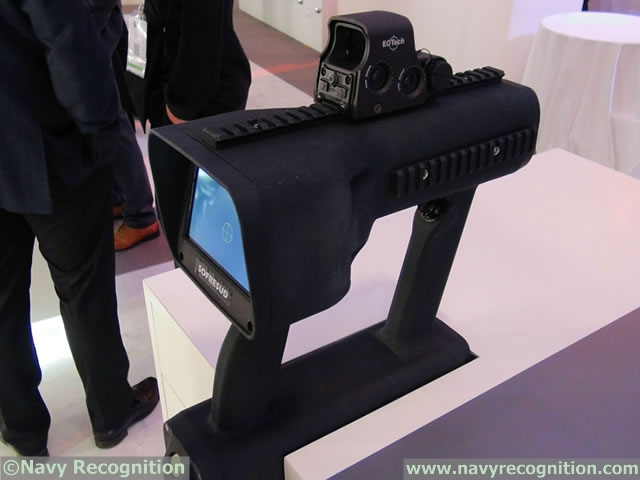 NavyRecognition reports an innovation in target designation that might have some additional uses. It is not really a firecontrol system, it’s an “Intuitive Pointing Device” (IPD). They refer to it as predesignation. It is really just a very sophisticated way to quickly and accurately input visual bearing and elevation, laser range, and image to a combat management system or remote weapons control station. 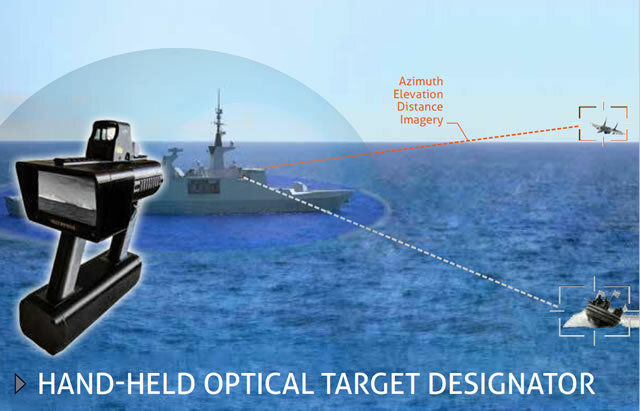 This is seen as needed particularly for fast and/or stealthy targets and low-level surface or ground-based targets that can be seen but are difficult for radar to pick out of the clutter. 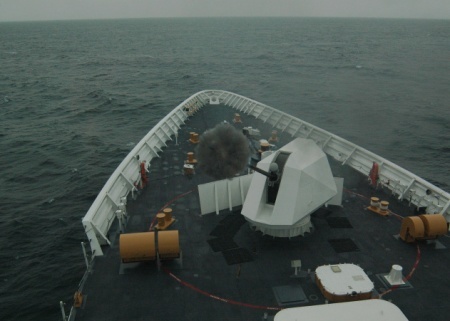 Sounds particularly useful in the swarm attack scenarios the Navy has been so concerned about. I got to thinking about alternative uses for this device, including visual navigation, setting buoys, or just checking contacts for bearing drift. That, in turn, got me to think about our customary visual bearing determination device, the alidade. I don’t think they have changed since WWII. Our alidades have no low light level or IR capability or any way to measure distance. They have no electronic connection to pass either bearings or a picture of what is being looked at. 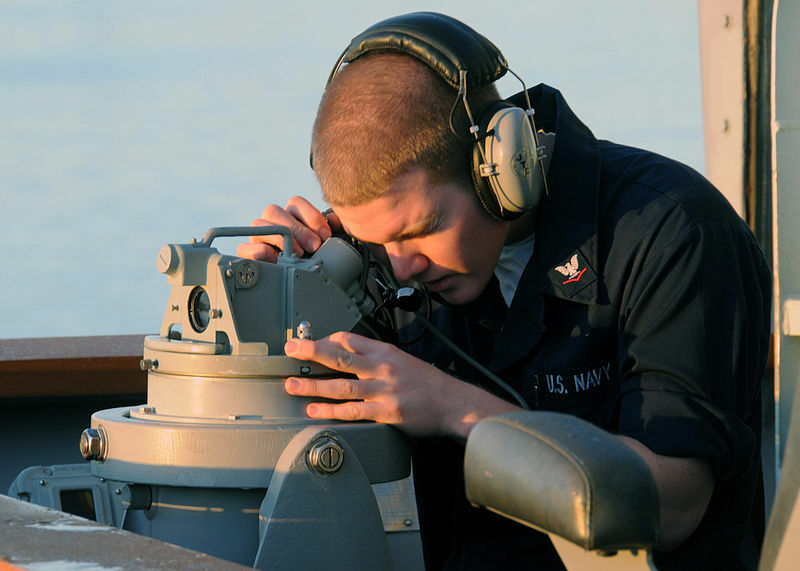 Wouldn’t it help the shipping officer in combat if he could get both an electronically transmitted visual bearing and a visual of a contact that would allow him to see the target bearing? Visual navigation could be both quicker and more reliable if bearings could be quickly and reliably be passed electronically with the navigator able to confirm that the bearing taker is looking at the point the navigator intends. The OOD or other bearing takers could benefit from a low light level or IR capability. And off course the ability to point at air targets might be useful. While the ergonomics of our alidades are very comfortable, there are potential problems with the IPD. Because it looks a lot like a gun, using it may lead to misunderstandings. There must be a protected place to put it down when not in use, but it is not illustrated. It’s probably too heavy to be used over long periods without some form of support. If it were redesigned to rest safely on the gyro repeater and be used for bearing taking from there, it might solve some of these potential problems. Still to point to air targets you would want to be able to lift it off the stand, here a collapsible wire stock might be helpful.